Staff members from Acumed reached the beach—Cannon Beach, to be specific—to help rid the sand of microplastics on August 15. 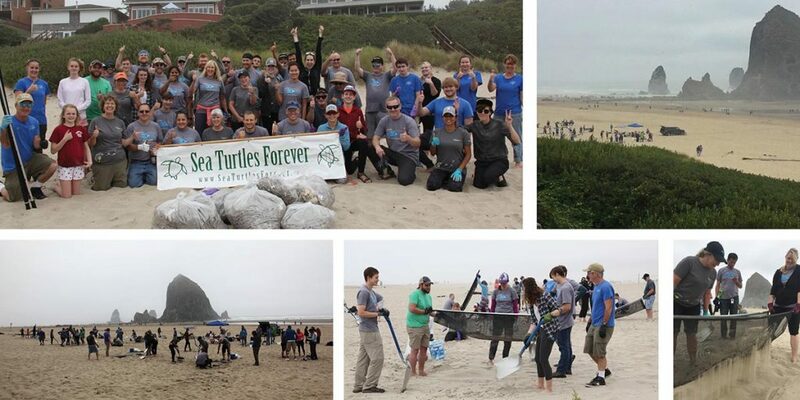 Working with the nonprofit organization Sea Turtles Forever and led by Acumed’s Green Team, the 40 Acumed employees, family members, and friends sifted through yards of sand in front of iconic Haystack Rock. The device they used is an invention created by Sea Turtles Forever founder Marc Ward. The Microplastic Filtration System consists of fine-gauge screen stretched between two aluminum poles. Workers on either end tip the sand-filled sieve back and forth. The motion builds up a static charge on the screen, capturing the tiny plastic particles, while the sand falls through. The particles are removed from the beach in buckets and bags. Microplastics (pieces of plastic less than five millimeters long) pack a big punch when it comes to pollution. Microplastics come from a variety of sources, including larger plastic debris that breaks down into smaller pieces, as well as microbeads found in some health and beauty products (in the process of being banned). These microplastics travel unchanged through waterways into the ocean. Aquatic life and birds can mistake the particles for food. Ward was moved to found Sea Turtles Forever when he witnessed a group of 100 sea turtles stagger ashore in Costa Rica and die. A necropsy found that the turtles had ingested a large amount of plastic, probably from swimming through a cloud of debris. “I had to do something. I couldn’t let that go,” says Ward. Marine plastics contain two types of chemicals: additive-derived chemicals and hydrophobic chemicals which are absorbed from the surrounding seawater (Teuten et al, 2009). Toxic organic contaminants such as polychlorinated biphenyls (PCBs) and nonylphenols have been detected in marine plastics (Mato et al, 2001). “As a medical device company that works hard to help patients regain their health, we felt that a great Green Team project would be to take on the microplastics that are polluting our beaches,” said Green Team Chair Sharon Sipprell. Sea Turtles Forever has been working in the field of marine sea turtle conservation along the Pacific coasts of Costa Rica and Oregon since 2002. During their work saving tens of thousands of sea turtle eggs from poaching, field operators noticed an increase in small pieces of plastic washing up on shore. This increase in pollution prompted the organization to conduct research in partnership with the University of Tokyo and Northwestern University around the effects of microplastic pollution on the surrounding environment and community. Sea Turtles Forever created Blue Wave, the Microplastic Response Team, in 2008, and since then they’ve been involved in marine plastic fragment research, filtration system development and testing, and group clean-up events in Oregon and California. “In the past two weeks we’ve been focusing on Cannon Beach Whale Park and I estimate we’ve pulled over 1,000 lbs. of debris from that beach. Now kids won’t be digging in mats of marine microplastic or those kinds of ugly hazards. I love this work, it gives me great satisfaction to restore this popular beach to a cleaner state for the kids, and for all who use this beautiful beach,” said Ward. The Blue Wave filtration systems are available for purchase for people who would like to organize their own event. Learn more about Blue Wave.